Citation: Hadi MAO, Talha AA, Ahmed AS, et al. Cyclin D1 immunohistochemical expression in Sudanese patients affected with prostatic carcinoma in Khartoum state. Allied J Clin Oncol Cancer Res. 2018;1(1):26-30. Prostatic carcinoma is a common public health problem in aging people. Cyclin D1 proto-oncogene is an important regulator of G1 to S phase progression in many different cell types, It is believed to play an important role in both tumorigenesis and grading of many cancers including prostatic carcinoma; high levels of these proteins have been reported in certain human malignancies and have been implicated in aberrant cell division and dysregulated tumor growth. The aims of this study were to examine the immunohistochemical expression of Cyclin D1 in prostatic carcinoma and to demonstrate the association or relation between Cyclin D1 expressions and to determine the aggressiveness of the malignant tumors by Gleason Score. In this study 50 samples, 25 cases of prostatic cancer and 25 cases benign prostatic tissues were studied for Cyclin D1 expression using an immunohistochemical technique which was performed on routinely processed, formalin fixed and paraffin embedded tissues; then tissues were sectioned into thickness of (3 µm to 5 µm) with rotary microtome instrument and immunohistochemical expression of CyclinD 1 was evaluated in all cases. All of the primary human prostatic cancer samples revealed in different ranges of intensity from weak (+1), moderate (+2) to strongly positive nuclear staining (+3) for Cyclin D1. In this study we revealed no nuclear staining in the benign prostatic hyperplasia (PBH) disease (+0) in 21 cases (84%) and 4 cases (16%) were ranged in different color intensity; 3 (12%) were weak (1+) and 1 (4%) case was moderate (2+) while prostatic cancer cases were also evaluated in different colors; 13 cases (52%) were (+3), 7cases (28%) were (+2) and 3 cases were (12%) were (+1) and only two (8%) were negative. There was no significance correlation between Gleason's score and intensity of Cyclin D1 expression. Conclusively we can say that Cyclin D1 may be helpful in the differentiation between BPH and prostate cancer, the correlation between the intensity of Cyclin D1 expression and prostatic diseases was statistically highly significant (p value=0.00).We recommended to use Cyclin D1 as a biomarker to prostatic carcinoma. Prostate cancer is currently the most common cause of cancer death in men. The exact cause of developing prostate cancer are not known though ageing, ethnicity and heredity are important factors involved in the initiation and development of this cancer. Ageing is considered the most prominent risk factor, with majority of cases being diagnosed in men between 60 and 70 years of age . In Sudan prostate cancer is the most common cancer in Sudanese men. The first National Population-based Cancer Registry (NCR) was established in Sudan in 2009. During 2009–2010, 6771 new cancer cases were registered in Khartoum state. Of those, 3646 (53.8%) cases were in women and 3125 (46.2%) were in men. The most commonly diagnosed cancer among women was breast followed by leukaemia, cervix, and ovary, and among men it was prostate cancer followed by leukaemia, lymphoma, oral, colorectal and liver . The development of Prostate Cancer (PC) occurs through the accumulation of genetic and epigenetic changes, leading to an inactivation of tumor suppressor genes and activation of oncogenes . These alterations most likely take several decades and cancer development can be considered a continuous transformation from benign cells, cancer precursors and malignant cells . Cyclin D1 proto-oncogene is an important regulator of G1 to S phase progression in many different cell types. It is believed to play an important role in both tumorigenesis and grading of many cancers including prostatic carcinoma; high levels of these proteins have been reported in certain human malignancies and have been implicated in aberrant cell division and dysregulated tumor growth . Because the role of Cyclin D1 in prostate cancer is unobvious, we studied the expression of Cyclin D1 in prostatic carcinoma and benign prostatic hyperplasia, relationship between Cyclin D1 expression and different Gleason Score. Tissue blocks obtained from 50 specimens of prostatic tissues, (50%) cases were previously diagnosed as malignant prostate tissues and (50%) cases were diagnosed as benign tumor. The specimens were obtained from histopathology section, Altyseer Medical Centre during the period of April 2017 to May 2018. Patients identification information age, histopathology diagnosis, malignant tumor grade were obtained from patients files. The immunohistochemical procedure was done as follows: one section (3 μm to 5μm) from formalin-fixed, paraffin-embedded tumors were cut and mounted onto adhesion microscope slides (super frosted slides pre-cleaned 1.1 mm thick 25.75 mm made in Chinacitotest Labware Manufacturing Co., Ltd. Wellkang). Following deparaffinization in xylene, slides were rehydrated through a graded series of alcohol and were placed in distilled water. Samples were steamed for antigen retrieval for Cyclin D1 using high pH (9) by water bath at 95°C for 30 min. After washing with PBS for 3 min Endogenous peroxides activity were blocked with 3% hydrogen peroxide and methanol for 10 min, and After washing with PBS for 3 min then slides were incubated with (20 μL) of Polyclonal antibody (anti- human Cyclin D1 PhosphoThr286 Immunotag), for 40 min at room temperature in a moisture chamber washed with PBS and secondary antibody was added and kept for 20 min. After washing with PBS for 3 min, binding of antibodies was detected, followed by adding 3, 3 di amino benzidine tetra hydrochloride (DAB) as a chromogen to produce the characteristic brown stain for the visualization of the antibody/ enzyme complex for up to 5 min. After washing with distilled water for 3 min slides were counterstained with haematoxylin (Mayer’s) for one min and then were washed in running tap water for several minutes 7-10 (bluing), then dehydrated, cleaned and mounted in DBX. Each slide was evaluated with investigator then the results were confirmed by consultant histopathologist. Grade 3+Strong (staining of ≥ 50%-40% cells). Statistical analysis was done using SPSS (statistical package for social sciences) version 16.0 computer program. Frequencies, mean and chi Square test values were calculated. Among the fifty studied cases twenty five (50%) were previously diagnosed as prostatic carcinoma, twenty five (50%) were diagnosed as BPH based on hematoxylin and eosin-stained sections. A total number of fifty cases of prostatic adenocarcinoma removed by radical prostatectomy procedure and benign prostatic hyperplasia were studied. The age of the patients ranged between 40 years to 100 years with mean age of 65 years. Most patients with prostatic carcinoma was range between 61 years to 80 years, 39 (78%) and residual were 6 (12%) which range between 40 years to 60 years and 5 (10%) which range between 81-100 as indicated in (Table 1). Table 1: Risk age group. The Gleason scoring of the studied prostatic carcinoma cases ranged between 2-10. The most prevalent score in the studied cases was Gleason score 4 (24%) as showed in (Table 2). Table 2: Frequency of prostatic carcinoma cases according Gleason score. The Gleason score of the studied prostatic carcinoma cases ranged between 2-5 and 6-10 (Table 3). The most prevalent score in the studied cases was Gleason score 6-10 (52%). Table 3: Gleason score group. There statistically significant difference in Cyclin D1 expression among prostatic adenocarcinoma, BPH and BPH+ chronic prostatitis cases with higher expression in carcinoma cases as show in Table 4 Pearson chi-square, value=36,6, df=6 and p-value=0.00 (highly significant). Table 4: Cyclin D1 expression among prostatic adenocarcinoma, BPH and BPH+ chronic prostatitis cases. 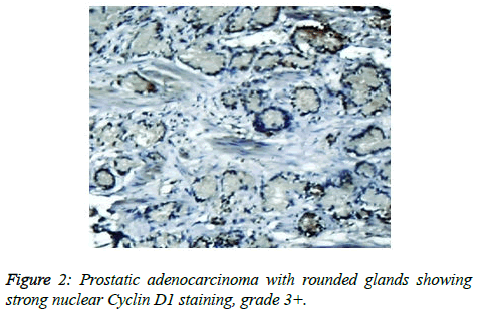 Cyclin D1 expression in 25 cases, in prostate adenocarcinoma and according to intensity of Cyclin D1 staining, Strong 3+, moderate 2+, weak1+ and negative 0, (Figure 1) and highest grade 3+ as showed in Table 5. Table 5: Frequency of Cyclin D1 staining intensity in prostatic carcinoma. 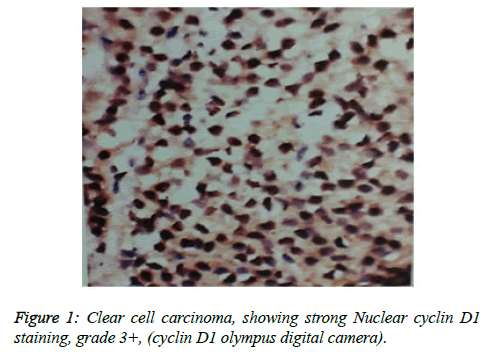 Figure 1: Clear cell carcinoma, showing strong Nuclear cyclin D1 staining, grade 3+, (cyclin D1 olympus digital camera). There was a negative significant correlation between Gleason Score and staining intensity for Cyclin D1 (-.135) and p.v no significant association (.519) (Table 6). Table 6: Correlation between intensity of cyclinD1 expression and Gleason score. Prostate cancer is a major public health problem in countries with aging population, and is now the most commonly diagnosed cancer in men as well as the second leading cause of male cancer deaths and occurs in 1 out of 6 men . There is many studies revealed association of prostate cancer with certain abnormalities as Cyclin D1 proto-oncogene which is an important regulator of G1 to S phase progression in many different cell types. It is believed to play an important role in both tumorgenesis and grading of many cancers including prostatic carcinoma . In previous studies it has been reported concerning the role of Cyclin D1 expression in prostate cancer. In the present study, all of the primary human prostate cancer samples revealed in different ranging according regions of staining intensity from weak, moderate to strongly positive nuclear Cyclin D1 staining in 23 out of 25 cases (92%). This study concordant to observations of Samia et al. who found that in prostate cancer the Cyclin D1 was expressed in 23 of 25 (92%) cases . The results obtained in the present study was almost agreement with the following studies found that 84.6% of cases of prostatic carcinoma showed Cyclin D1 expression. These results indicated that increased expression of Cyclin D1 in malignant prostate tissue and also found that 90% of prostate cancer revealed positivity of Cyclin D1 [9,10]. Correlation between Cyclin D1 and Gleason grades was not significant (Figures 2 and 3) . Cyclin D1 expression was seen with higher frequency in prostatic carcinoma and also observed focally and weak staining may be seen in benign cases but that had never reached a significant proportion as seen in carcinoma of the prostate. However, the study observed no significant correlation of Cyclin D1 expression with Gleason grade . Chen notice that over expression of Cyclin D1 increases cell growth and tumorigenicity in human prostate cancer (Figure 4) . Hosni et al. found that all cases (100%) revealed foci (>10% of cancer cells) with positive nuclear staining for Cyclin D1 with different grades ranging from moderate to strong. No significant correlation was found between the intensity of Cyclin D1 expression and Gleason's score . Ozbek et al. reported more expression of Cyclin D1 in prostate cancer samples, but our study was different from previous study reported by Shiraishi et al. who noticed positive nuclear Cyclin D1 expression in 20 out of 66 (30%) studied cases , and in same contrast with Kallakury et al. found that Cyclin D1 positivity in 31 of 140 prostate cancers (22%) of studied cases and also different from that reported by Kallakury et al. and Han et al. reported the moderate to strongly positive staining for Cyclin D1 in twelve of the 50 primary prostate cancer samples (24%) we can't suggest a cause for this obvious discrepancy, other than different in diagnostic approaches . In the present study we also observed no significant correlation between Cyclin D1 expression and Gleason score as shown in Table 6. The findings of the present study was quite similar to results that observed by Samia et al. , Drobniak et al. , Hosni et al. , Fleischmann et al. , Nagela et al. and in disagreement with Comstock et al. who reported that significant correlation between Cyclin D1 and Gleason score. In this study BPH revealed no staining in the epithelial cells (84%), but there was low staining in benign prostatic hyperplasia with prostatitis to Cyclin D1 staining was congruent to study reported by Alqahtani et al. who reported that 84% of PBH showed negativity to Cyclin D1 and Samia et al. reported that in BPH group, only 3 cases (20%) showed positive nuclear Cyclin D1 expression , and also Comstock et al. . But this study was disagree with Ueda et al. who found that 53.8% BPH cases were positive to Cyclin D1. In the present study we also observed 1 case (4%) cytoplasmic positive of 25 cases which was in disagreement with Comstock et al. who reported that most tumors showed cytoplasmic restriction of Cyclin D1. Gupta et al. found 24 cases showed both nuclear and cytoplasmic positivity, whereas 2 cases showed cytoplasmic and 4 cases showed nuclear positivity only to Cyclin D1 staining and another only nuclear Cyclin D1 staining. Figure 2: Prostatic adenocarcinoma with rounded glands showing strong nuclear Cyclin D1 staining, grade 3+. Figure 3: Prostatic adenocarcinoma, showing moderate nuclear Cyclin D1 staining, grade 2+. Figure 4: Cyclin D1 staining in benign prostate tissue. Showing negative staining of the benign prostatic tissue and the absence of staining in the nucleus grade 0+. Conclusively we found most of Cyclin D1 expression in prostate carcinoma was 93% of cases while in benign prostatic hyperplasia was 16% and the correlation between Cyclin D1and Gleason score showed negative significance. Dr. Albadwi abdelbagi Talha and Abdairaheem Ali Babiker lecturer in University of Gezira, FMLs and Dr. Ali Seed Ahmed consultant of histopathology and cytology in Al- Tyeseer medical centre. Shen MM, Abate Shen C. Molecular genetics of prostate cancer: new prospects for old challenges. Genes Dev. 2010;24(18):1967–2000. De Marzo AM, Platz EA, Sutcliffe S, et al. Inflammation in prostate carcinogenesis. Nat Rev Cancer Aper. 2007;7(4):256-69. Murphy GP, Busch C, Abrahamsson PA, et al. Histopathology of localized prostate cancer.Consensus Conference on Diagnosis and Prognostic Parameters in Localized Prostate Cancer. Stockholm, Sweden, May 12-13, 1993. Scand J Urol Nephrol Suppl. 1994;162(7):115-27. He Y, Franco OE, Jiang M, et al. Tissue-specific consequences of cyclin D1 overexpression in prostate cancer progression. Cancer Res. 2007;67(17):8188-97. Raju B, Mehrotra R, Oijordsbakken G, et al. Expression of p53, cyclin D1 and Ki-67 in pre-malignant and malignant oral lesions: association with clinicopathological parameters. Anticancer Res. 2005;25(6C):4699-706. Ferlay J, Shin HR, Bray F, et al. Estimates of worldwide burden of cancer in 2008: GLOBOCAN 2008. Int J Cancer. 2010;127(12):2893-917. Samia M Gabal, MD Samar A El Sheikh, MD Hala M El hanbuli, et al. Immunohistochemical Expression of Cyclin d1 and ki 67 in Premalignant and Malignant Prostatic Lesions. Int J Adv Res. 2017;5(8):1553-61. Ueda N, Yamashita M, Kuroda I, et al. Immunohistological evaluation of the expression of P27 and cyclin D1 in prostatic specimens. Nishinihon Journal of Urology. 2001;63(4):246-9. Alqahtani F, Ihab Shafek Atta, EA Mady. p63 and Cyclin D1 expression in benign prostatic hyperplasia versus prostatic adenocarcinoma: A clinicopathologic radiologic and immunohistochemical study. Int J Healthcare Scie. 2015;2(2):305-20. Gupta V, Singh S, Sen R, et al. Role of cyclin D1 immunoreactivity and AgNOR staining in the evaluation of benign and malignant lesions of the prostate. Prostate Int. 2014;2(2):90-6. Chen CD, Welsbie DS, Tran C, et al. Molecular determinants of resistance to antiandrogen therapy. Nat Med. 2004;10(1):33-9. Hosni HN, El Rahman MA. 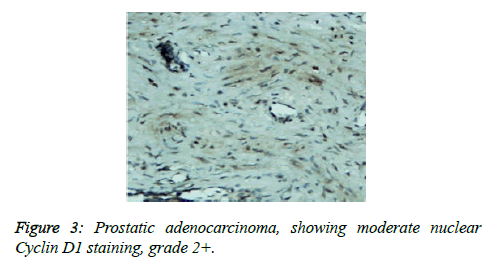 Immunohistochemical Expression of Cyclin D1 in Egyptian patients with prostatic carcinoma. The Medical Journal of Cairo University. 2010;78. Ozbek E, Mizrak B, M Ozbek, et al. Cyclin-D1 protooncogen expression in prostate cancer. Turk J Cancer. 2000;30(1):15-21. Shiraishi T, Watanabe M, Muneyuki T, et al. A clinicopathological study of p53, p21 (WAF1/CIP1) and cyclin D1 expression in human prostate cancers. Urol Int. 1998;61(2): 90-4. Kallakury BV, Sheehan CE, Ambros RA, et al. The prognostic significance of p34cdc2 and cyclin D1 protein expression in prostate adenocarcinoma. Cancer. 1997;80(4):753-63. Han EK, Lim JT, Arber N, et al. Cyclin D1 expression in human prostate carcinoma cell lines and primary tumors. Prostate. 1998;35(2): 95-101. Drobnjak M, Osman I, Scher HI, et al. Overexpression of cyclin D1 is associated with metastatic prostate cancer to bone. Cl Cancer Res. 2000;6(5):1891-5. Fleischmann A, Rocha C, Saxer Sekulic N, et al. High CD10 expression in lymph node metastases from surgically treated prostate cancer independently predicts early death. Virchows Archiv. 2011;458(6):741-8. Nagla MAG, EL Sadig A Adam, Nada Salih S. Immune Histochemical Prostatic Evaluation of Cyclin D1 in Adenocarcinoma and Benign Prostatic Hyperplasia in Small Neddle Biopsy of Sudanese patient. European Academic Research. 2016;4(2):1727-33. Comstock CES, Revelo MP, Buncher CR, et al. Impact of differential cyclin D1 expression and localisation in prostate cancer. Br J cancer. 2007;96(6):970-9.